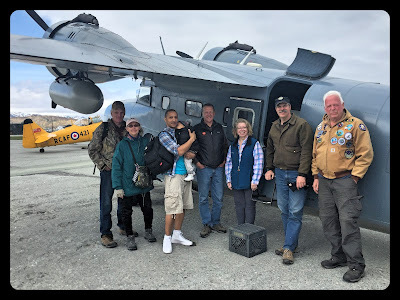 Florida Beaches To The Bering Sea: For The Love Of Flying! 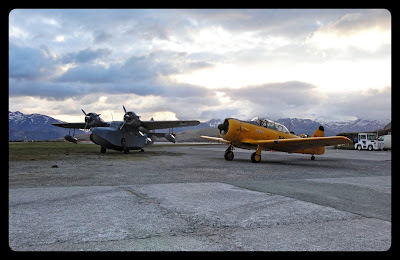 One of the areas I worked diligently on during the planning of the Commemoration of the 75th Anniversary of the Bombing of Dutch Harbor and Aleut Evacuation in Unalaska (Dutch Harbor) this past June, was making sure we had some period planes attend the event. For the first eleven months, the Aleutian campaign took place primarily by air in some of the most dangerous flying conditions in the world. It was important for the airmen and the planes that they flew, to be represented. I may be stating the obvious by saying that I could possibly be slightly biased but that really is a fact, these planes serve to be an important living history item at any event and people truly love seeing these old birds! Just take a look at Richard... he just got off the Harvard! With the help of PenAir, Alaska Airlines, APIA (Aleutian Pribilof Island Association), Alaska Humanities Forum and numerous other community sponsors, we were able to bring the CAF (Commemorative Air Force) Alaska Wing’s Harvard Mk lV (AT-6) and a privately owned 1942 Grumman Goose to Unalaska for the community to enjoy. And enjoy they did! Those planes had line ups the entire weekend flying gleeful community members well into each night and far exceeding anyone’s expectations of their participation. Goose owner, John Pletcher & pilot Burke Mees beside him. From that point on, those guys did not stop flying with wait times reaching three hours at one point! 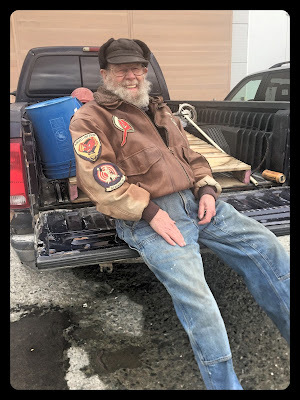 You know, there is something quite special about seeing the wonderment on the faces of those witnessing the magic of aviation, eyes as big as gumballs, or maybe those were mine…. anyways, I see it time and time again at airshows. There is something so special about a warbird. It has a story to tell. I guess that is why I enjoy them so much. I want to hear their story. The eagles have landed in Dutch Harbor. 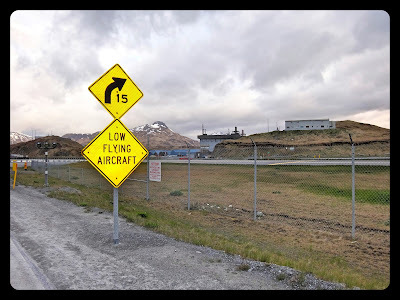 Just another road sign in an aviation community. 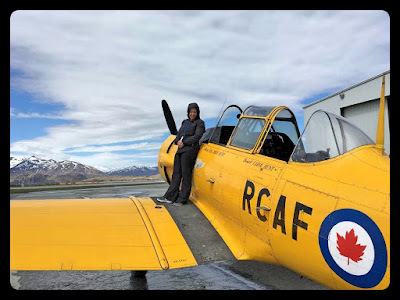 The Harvard, the Canadian or British name for an AT-6, was a two seat trainer aircraft used by all branches of military to prepare their pilots for flying the more advanced fighters like a P-51 Mustang or P-40 Warhawk. 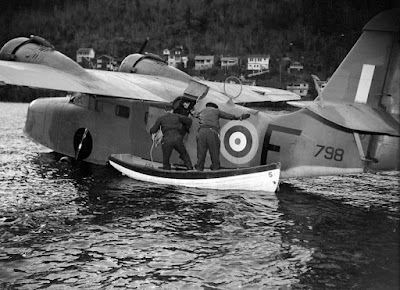 The Canadian squadron had them in Alaska and used them to check out new pilots who had come up to join the squadron and also according their squadron diary, used them for transport of squadron members to different bases. 111 (F) veteran, LAC Harold Cross, told me a great story about how they used them for a target training exercise. While stationed in Pat Bay (Victoria Airport), just before deployment to the Aleutians, the LAC's (Leading Aircraftmen) would take the back seat loaded with barrels filled with aluminum dust stacked six high on their laps. One by one, they would throw them over the side of the plane into the water. The pilots and their P-40's would then use the floating barrels as target practice. A cloud of dust indicated a direct hit. We actually found Harold's name as the second pilot (back seat) in my grandfather's flight log book during one of these exercises! My grandfather P/O R.W. Lynch, RCAF and his Harvard, 1941. The Grumman Goose is a twin engine amphibious plane that started out as a luxurious eight seat flying commuter plane. Come war time, it morphed into the ideal U.S. military transport plane and ended up serving with many other air forces including the RAF and RCAF. 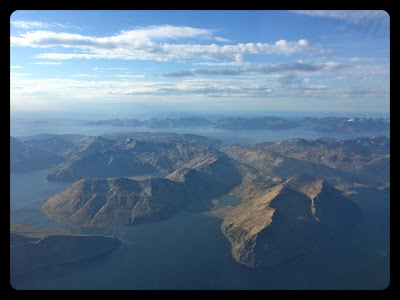 It was ideally suited for commuting around Alaska and continues to be well known around the Dutch Harbor area. 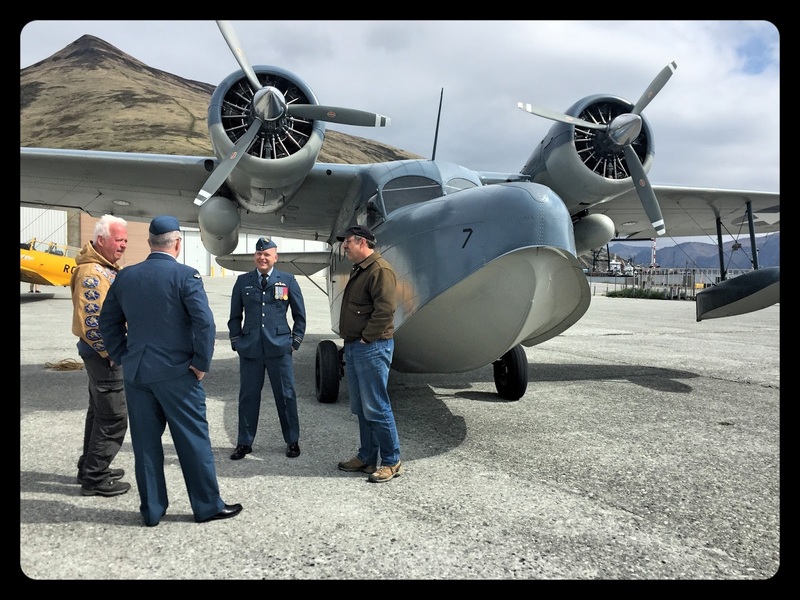 In fact, Burke used to fly the Goose in Unalaska right up until 2012. 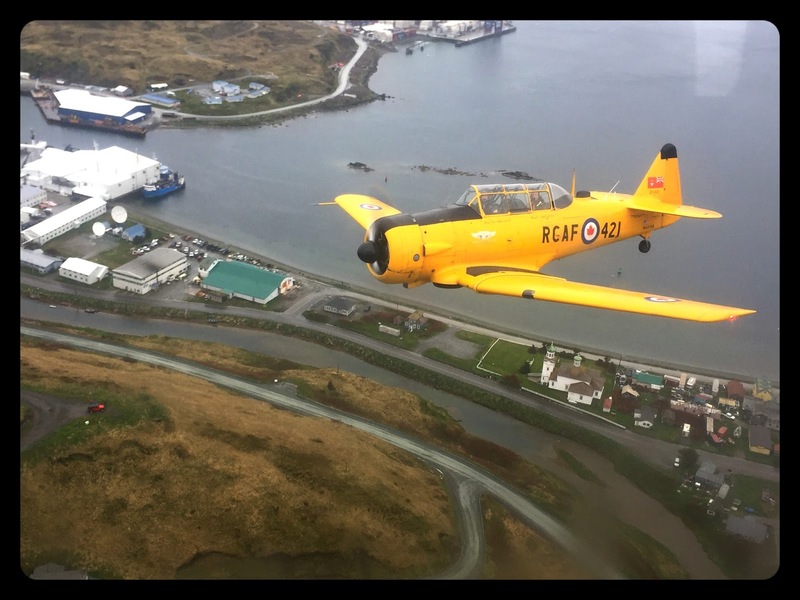 Aside from warbird rides for the community, the aircraft also teamed up for some formation flying during our fly overs with WWll Aleutian veteran pilot Lt. Col (RET) Bob Brocklehurst in the right seat! To some of you, this name may sound familiar, this is the same young man who just flew the TF-51 Mustang in Florida this past February! Talk about an inspiration. Bob turned 97 in July. Our Co-pilot, WWll Aleutian Island veteran pilot, Lt. Col (RET) Bob Brocklehurst. Formation flying is the bomb! View from the Goose during the fly over. If you want to see some video of footage of all things aviation, including the water landing in the Goose (oh baby, was that awesome..) during the 75th, you can check out the eight minute montage I created. 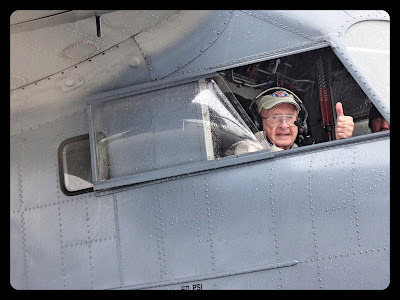 And most importantly, if you enjoy warbirds then joining the CAF (Commemorative Air Force) is a great way to keep the legacies of these airmen and the planes they flew alive! 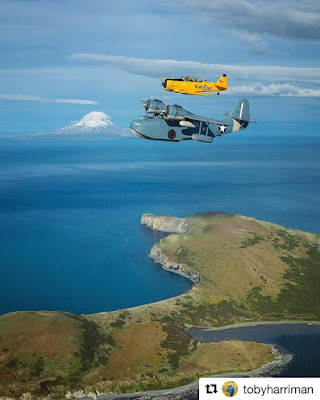 They are the ultimate living museum and they endeavor to keep at least one of every type of warbird flying so that the lessons of what these planes represent will always be remembered. 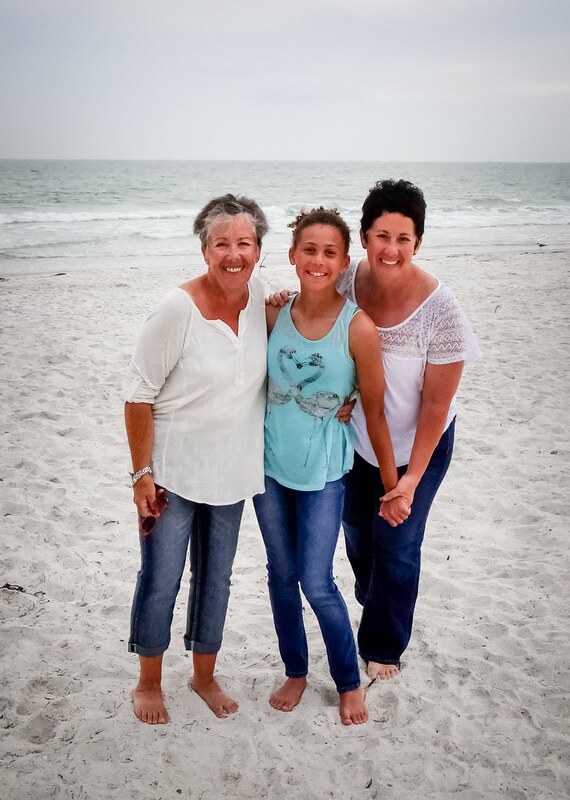 They have local chapters (Wings) all over the country with dedicated and passionate volunteers who could use your support. Being part of the CAF is one of the best things I have done in the last few years! Click on the link to find the wing nearest to you, tell them I sent you! Hi Pierre and thank you! Glad you are still reading.